Honey Bee Holistics Wellness Series continues: Your skin is what you……..PUT ON IT! How often do you think about how the products you put on your skin affect your overall health? There is actually quite a bit of research tied in with how the products you put on your skin DO affect your health. Check out the information provided by the David Suzuki Foundation who is a leader in the Green Living ways here on the Dirty Dozen Toxic Ingredients found in conventional beauty products! If so, then you are applying a formaldehyde containing preservative to your body! It not only is absorbed into your skin to then be included in your bloodstream, but slowly off-gasses so you then breathe it in too! Check out this article to go deeper in the explanation of this. The harm is that when they slowly release small amounts of formaldehyde, you are exposed to cancer causing components. Did you find any of THESE ingredients in the list? These preservatives are known to be endoctrine disruptors and can cause allergic reactions in some individuals! Why is it so important to consider WHAT you put on your skin? 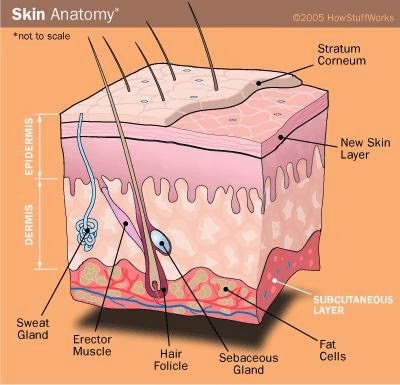 Lets talk about a skin pore for a moment and how it relates to the body! The skin is your bodies LARGEST organ that is mostly overlooked as a possible entrance into the body and its health. Check out this graphic of a skin pore and how the hair follicle is directly linked to your bloodstream! It may be said by some manufacturers that , “A little bit won;t hurt you and give you cancer”. Maybe not, but a plethora of products ALL COMBINED over the course of a day, even a lifetime adds up. Your skin absorbs the toxins, then it is filtered to your liver. When your liver can no longer handle the toxic overload from all of the perfumes, preservative containing products AND environmental toxins you can do nothing about, it has to go SOMEWHERE?? A lot of toxins are stored in our body fat to make sure it is far enough away from our vital organs for preservation of the body to continue functioning. Just consider for a moment all of the products you use on a daily basis. Make a list if you feel inclined to do so, then start with ONE product replacement. WHAT do you use instead?? This is one of the BIGGEST questions I asked myself when I started my journey to whole wellness. I didn’t start out making ALL of my products I use everyday, but started with ONE and added on as I felt ready to do so! Here are a few ideas for you! ♦Start with changing your deodorant to one without aluminum. Here is the one I make that is my BEST SELLER! ♦Start with changing your body lotion! This is my Best Selling one for the whole family! ♦Start with changing the Soap you wash with! Bar soap has just as many suds as the liquid body washes do when you rub it in circles on a pouf! Check out my soaps here! NOW tell me in the comments below : WHAT ITEM ARE YOU STARTING OUT WITH CHANGING FIRST? WHAT WOULD BE THE HARDEST TO CHANGE AND WHY? Don’t forget to sign up for my Newsletter where you get the inside scoop on my newest products and special unadvertised deals HERE! Calendula……Have you met this bright yellow-orange beauty? There is a bright orange & yellow flower that I grow each year,Calendula Officinalis. Its actions are antiseptic, anti-fungal & anti-inflammatory. It is widely used by herbalists for its gentle approach to healing. 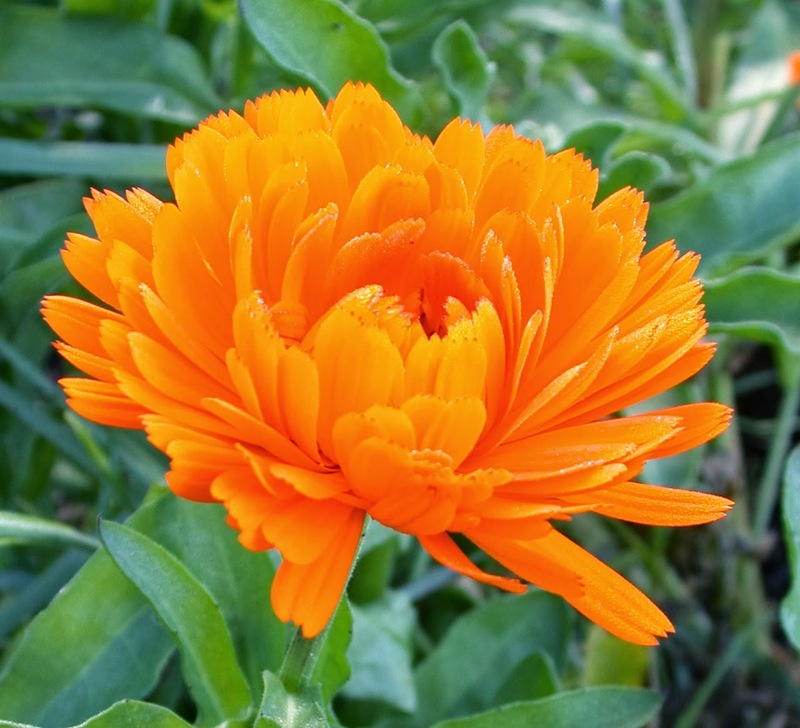 Calendula is beneficial for dry & damaged skin thanks to its anti-inflammatory action. 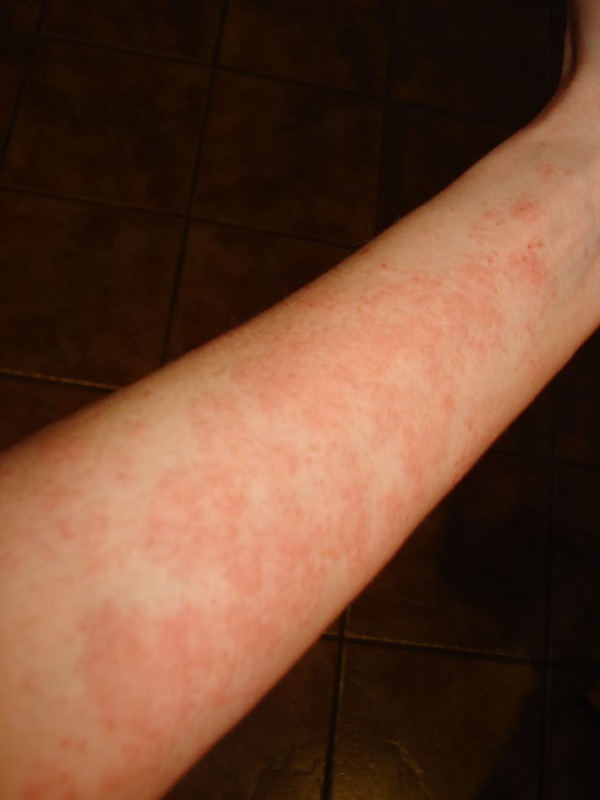 I saw it go to work first hand on my own eczema! If you have ever read my story as to why I first became interested in making my own products, then you know a bit of it already. I was 26, and up to this point in my life I did not really have any skin issues to speak of except an occasional pimple once a month. When I had started getting a dryness on my arms I reached for the well known “oat based” lotion. This helped it, but only for a few hours until it became itchy again. Thank goodness it was during the cold season, as I was able to wear long sleeves then, because it looked horrible. As time went on, it started to blister up and crack. I would find myself waking up in the middle of the night scratching my arms. When I would itch it would feel good for a split second until it started to burn like my arms were on fire!! I am a “do-it-yourself” kind of gal, so I did not run to the Dr. right away. I planned on toughing it out until I found something that worked, THEN if it got too bad, I would go to the Dr. and possibly get a script. I started checking into all of the ingredients on my “oat-based” lotion. It was as follows: Water, Glycerin, Distearyldimonium Chloride, Petrolatum, Isopropyl Palmitate, Cetyl Alcohol, Dimethicone, Benzyl Alcohol, Sodium Chloride (table salt). No more store bought lotion for me! I started my research for a recipe for a lotion that was made simple with minimal ingredients. Trust me, this was not easy! Most were lotions pre-made that I could add scents to, not a recipe to make it from scratch. THEN I came upon a well known herbalist, Rosemary Gladstar! Rosemary had so much information I started off with a few of her books. I had a feeling that I was on the right track and just went with it! It was the beginning of my love for herbs♥ This shining through my soul like a light guiding me to my own healing refuge. She goes through the steps and information to make your own lotion using beeswax, oils and healing herbs. I read it over & over & over again! I wanted to make it imprinted on my mind so I could easily create masterpieces of healing lotion for my aching skin. 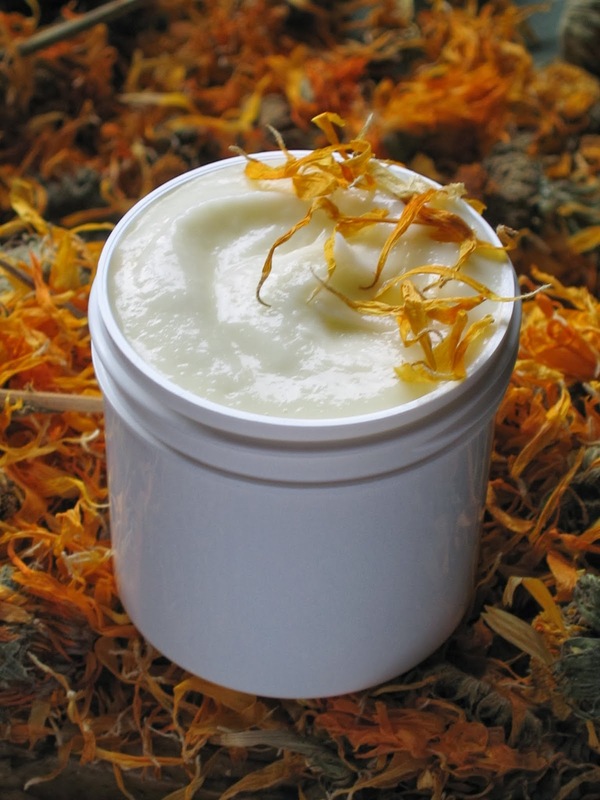 Calendula is highlighted in one of Rosemary’s skin healing salves. I saw this as an herb that would be good in a lotion too! So I chose the hot extraction method and began infusing my Organic Olive Oil with the Organic Calendula petals. It turned the oil a beautiful deep yellow-orange and had a gentle flower scent to it. I then used this infused oil to make my first lotion!! After using it for only a few days, my arms itched less. Then after a week, the redness was gone and it was healing up nicely! I was completely astounded and wanted to know more. I thought to myself, “I bet there are other people out there who could benefit from this too!”. The rest you can read in my About Me page here, if you would like the continuation of how my business grew! Now I had some healing Calendula lotion and became educated each time I opened another book on how herbs can heal our bodies. My Organic Calendula lotion is now my #1 Best Selling Lotion and continues to help people of all ages! Here are a few testimonials from my Etsy customers who shared their story. ♦Barbara Rowlete: I am 67 years old, Irish,and have so many problems with my skin. I had cancer 4 years ago, and have done organic foods, and as many organic skin care items as my skin will allow. I really like the lotion it goes into the skin,and with my dry skin after one application was so much better. I hope I have helped educate you on how Calendula can be one of the best assets in your herbal arsenal!! Next herb to be highlighted is a long time favorite……Lavender!! 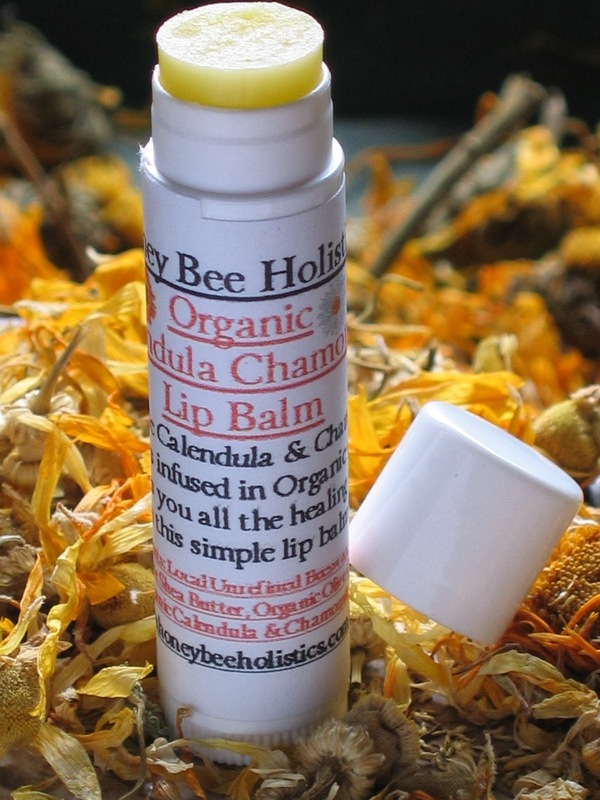 Would you like to try some of my Organic Calendula products for yourself? Comment below as to why YOU need Calendula in your life for a chance to WIN a 1 1/2oz Organic Calendula Lotion of your own!! **Don’t forget to put in your email address so I can contact you if you win! THE WINNER is ………… Angie!! Wow, calendula sounds like a miracle ingredient! I get this weird little patch of eczema during the winter times on the top area of my eye lid, and nothing I have has healed it. I would love to see if that lotion can help relieve that sensitive area of my face. CONGRATULATIONS Angie on winning your OWN 1 1/2oz Organic Calendula Lotion! !